Kell Brook stopped Frankie Gavin in his second IBF walterweight title defense, Gavin was simply out of the league when it came to Saturday night. 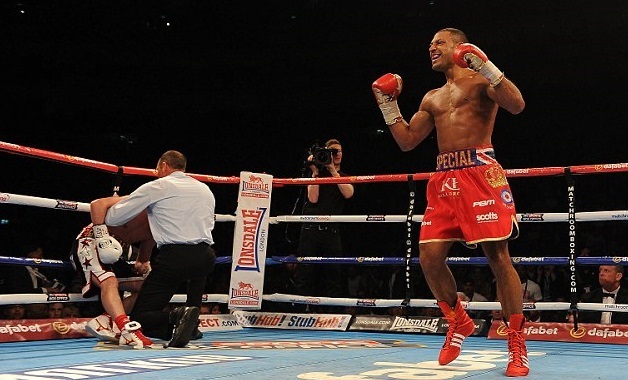 Kell Brook was relaxed, confident and picked his shots pretty good. Anthony Joshua continued his knockout stream by knocking out Kevin Johnson in second round while Lee Selby stole the show with impressive win. Kell Brook dominated Frankie Gavin who quite frankly was never in the same league, Brook has called out Amir Khan again for British affair later in the year and according to him he has made statement for big title fight against Mayweather Jr having defending his IBF title for second time already. Kell Brook will be taking on Frankie Gavin for the IBF walterweight title come this saturday in O2 Arena, London and the fight will be the main event of Sky Box Office pay per view. There are several great undercard fights scheduled in the same night and this might turn out to be a cracking boxing night for UK fans. British heavyweight prospect Anthony Joshua will take on his first real test in Kevin Johnson while Lee Selby takes on Evgeny Gradovich for the IBF featherweight title fight. The undercard fights are scheduled to get under way at around 7:30 PM UK time (Saturday night) and we can safely assume that the main event between Kell Brook vs Frankie Gavin won’t start before 11:30 PM Uk time. Below is the tentative schedule of all fights.